Check this one out. The 3rd Parrot chases away the Blue Gourami so that Pinky and Amber can go about their business! There were successful! This is a picture of Amber protecting the nest. 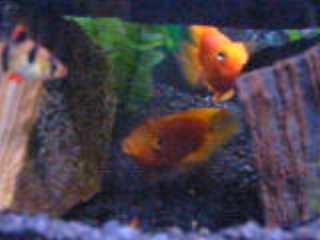 The little bumps on the left rock are the eggs! Click image above for enlarged view! 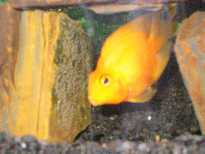 Click image above for movie of Amber (yellow Blood Parrot) chasing Nibbler (baby Tiger Barb) away from the nest!